My daughter started talking very early. Everyone was amazed at how clearly she could speak considering she wasn't even two years old yet. The only problem was, she stuttered. Once she finally got the ball rolling, she spoke great, but it always started out with, "M-m-m-m-m-ommmy, can I have some milk?" Since she's our first child, we didn't know if this was normal or whether we need to intervene. Luckily we spoke to our pediatrician about it right away and he advised us not to say anything to her. He said that if she was just given time and we didn't damage her self-esteem by correcting her, that it would likely resolve on its own. And I'm happy to say that it did. She is almost four now and speaks without even a hint of a stutter. Most people probably won't even remember that she ever went through that phase. We were lucky, but many people are not so lucky and do need a bit of guidance on helping their child. Jacky Gilchrist specializes in writing about health and medical topics. She writes a blog for Speech Buddies, a company that offers speech therapy products to parents and speech therapists. Gilchrist contacted me a few weeks ago and asked if she could guest-post here, giving my readers some insight into what is normal and what isn't. Gilchrist covers topics such as coping with specific speech disorders, encouraging vocalization, and navigating the legal procedures involved with special education. It’s perfectly natural to worry about your child and wonder if he is developing at a rate that is on target for his age level. The world of pediatrics is overflowing with milestone charts that measure everything from gross motor skills to cognitive abilities to language and speech development. Just remember that every child develops at his own pace. Avoid panicking if, for example, your one-year-old is a little slow to point to his a picture in a book upon request. While this is considered to be the target age for that particular skill, some toddlers simply need a bit more time. That said, you know your child best. If you feel that he might show signs of a speech disorder or delay, it’s always best to take him to a speech-languagepathologist (SLP), or speech therapist, sooner rather than later. If your child does require speech therapy, starting a treatment program before he enters elementary school is preferable. This way, a speech problem is less likely to hold him back academically. However, the SLP might also recommend waiting in certain cases, depending on the age of your child and his specific issues. Under some circumstances, your child’s speech and language might “catch up” with the target level for his age group. The term “speech disorder” covers everything from stuttering to dysarthria (a neurological condition that compromises oral-motor muscles). While it’s impossible to cover every speech and language issue in one article, here are a few of the common signs to watch out for. 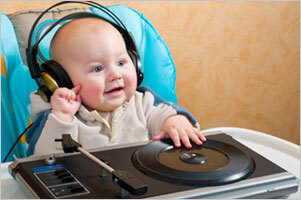 Children with articulation disorders have trouble producing sounds. Some sounds may be omitted entirely, while others may be pronounced incorrectly. For example, you may notice that your toddler says “gog” instead of “dog.” Your child may also add extra sounds onto words, or he might simply be very difficult to understand. An expressive language disorder means that your child has problems selecting and using words to express himself. A receptive language disorder means that your child has difficulty understanding spoken or written language. A child could also have a mixed expressive/receptive language disorder. Some of the common signs of the former include slow acquisition of words, delays in babbling, and problems with the rules of language. Children with a receptive language disorder may appear to be ignoring a person who speaks to them, may have trouble following directions, and may frequently repeat words and phrases. This repetition of spoken language is called echolalia; it can also be a sign of other speech and language problems. These are just a few of the speech and language issues that speech therapists commonly treat. Check out the American Speech-Language-HearingAssociation’s website for a more comprehensive resource on speech and language in children. I’d like to stress again that every child develops differently. Use these speech and language milestones as a general guide to the development of your child. By the time a child is three months old, he typically begins to react to noises and make cooing noises. By the time a child is six months old, he typically begins to babble with various sounds, including “m,” “b,” and “p.” He also giggles, attentively listens to music, and looks in the direction of sounds. By the time a child is about one year old, he typically will point to pictures in a book or to a specific body part upon request. He will often begin to follow simple directions. His articulation may still be unclear much of the time, but parents will typically understand some of the words. 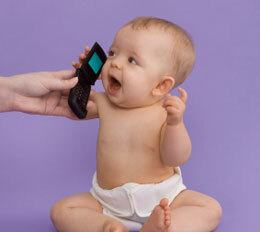 By the time a child is three years old, he may speak 250 to 500 words. He will also typically link three to four words together in a simple sentence. By age four, a child will typically speak in complete sentences, speak clearly enough for non-family members to understand, and answer simple questions. If you’re concerned at all about your child’s speech and language development, it’s always best to consult a speech therapist. She can assess your child’s development to determine if there is indeed an issue. She can also advise you as to whether waiting or initiating speech therapy would be effective for your child’s individual needs. If you enjoyed this post, you will love my book! It was released in July, 2012 and was co-written by me and Susan Case, a Kindergarten Teacher. In this unique book, we will help you save your sanity! If you have ever tried to cook dinner while your kid clings to your leg and cries, this is the book for you! We worked together to give a Mom's point of view and a teacher's point of view, so that we could give you activities that not only keep the kids busy, but also keep them motivated to learn and develop their natural curiosity. Kids behave better when they are given challenging projects to work on, which will in turn give you more free time to do the things you really need to do, like washing dishes, paying bills, and relaxing so that you can be a better Mom! Nope no language problems here. I knew my little GG was gong to be a chatterbox...Hello I am her mama. She started saying words before 2 and has not stopped. Great post. Thank you for the thoughtful post....my son is 18 months old & although he understands EVERYTHING & is advanced in other ways & doesnt have any hearing issues he still only says a couple of words (dad & nana) I never even hear him say mama...Our doctor is concerned & he maybe starting early intervention soon. We know another 18 month old who is also not talking & their doctor isnt concerned at all. It makes it difficult as a parent to know what is normal or not & if additional steps should be made or if it will happen when he is ready. Lots of people share stories of how children they know didnt start talking at all until after 2 & others think there could be an issue. I have a speech impediment (r's, sh's mainly) and my parents did say that they were hesitant to pay for speech therapy, but I really needed it. My husband and I are raising our daughter bilingual, so I worry a lot about her speech progress. So far she seems to be doing okay. We'll see how she does starting preschool when she doesn't speak very much English. A Low-Maintenance Princess Party? Yeah right! Yes, We Watch TV Sometimes and I'm Not Ashamed!